In February this year agile movement completes 11 years of existence. I am sure you are either using some form of agile methodology or examining the possibility of using them. But, are you aware of how the agile movement happened? Did it happen by chance or was it inevitable? Do you know what influenced the agile manifesto? Who the authors are? What are their backgrounds and what do they do now? How was the name “Agile” selected? Prior to the meet all these methodologies were classified as “Lightweight Methodologies”. The meet happened as a logical consequence of an earlier get together of XP proponents organized by Kent Beck. 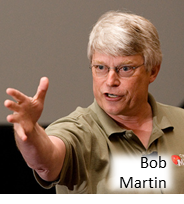 The push for the actual meet came from Bob Martin. Here are the milestones (1992-2003) that had significant impact on the movement. Also, I have tried to attach a face to every name – hope you find it interesting. Crystal was the starting point of the evolution of software development methodologies which ultimately resulted in what we know as agile movement. 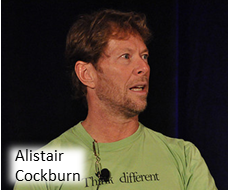 The honor of creating Crystal goes to Alistair Cockburn. The methodology was named “Crystal” only in 1997.Crystal can be applied to teams of up to 6 or 8 co-located developers working on systems that are not life-critical. You can see the seeds of agile manifesto in Crystal because it focuses on – (1) Frequent delivery of usable code to users, (2) Reflective improvement and (3) Osmotic communication preferably by being co-located. 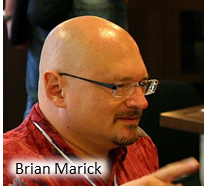 Here is a post by him on “Notes on the writing of the agile manifesto“. I could not locate him in LinkedIn. Refactoring was coined by Bill Opdyke in a paper titled “Creating Abstract Superclasses by Refactoring”.This is how Wikipedia describes code refactoring:Code refactoring is “disciplined technique for restructuring an existing body of code, altering its internal structure without changing its external behavior”, undertaken in order to improve some of the nonfunctional attributes of the software. DSDM, unlike all the other items listed in this post, was created by a Consortium. The consortium was an association of vendors and experts in the field of software engineering. 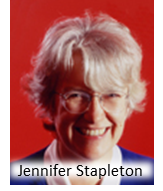 The objective was to “jointly developing and promoting an independent RAD framework” by combining their best practice experiences.There isn’t any individual who can be credited with the creation of DSDM but Jennifer Stapleton, as one of the founder member of DSDM consortium was instrumental in the initial compilation of thoughts. Arie van Bennekum, one of the authors of the agile manifesto has been actively involved in DSDM and the DSDM Consortium since 1997.DSDM focuses on the following 8 principles of (1) Focus on the business need, (2) Deliver on time, (3) Collaborate, (4) Never compromise quality, (5) Build incrementally from firm foundations, (6) Develop iteratively, (7) Communicate continuously and clearly and (9) Demonstrate control. Again, you can see the seeds of agile manifesto! SCRUM was jointly created by Jeff Sutherland and Ken Schwaberwho presented a paper describing it at OOPSLA ’95 in Austin, Texas.Jeff Sutherland is the CEO at Scrum, Inc. (Source: LinkedIn profile). 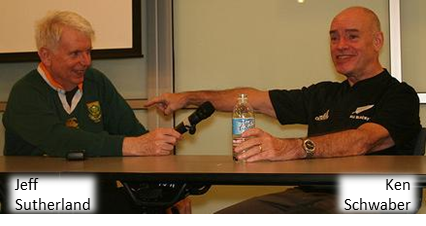 Ken Schwaber is a founder of Scrum.org. (Source: LinkedIn profile). 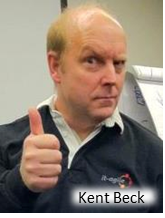 Mike Beedle has been one of the very early adopter on Scrum and has introduced Scrum to many organizations since the mid-90’s.As you know Scrum has practically been the de facto standard for agile. Pair Development as a concept was simultaneously but independently written about by more than one person.Jim Coplien published a paper titled “A Development Process Generative Pattern Language” which contained a pattern “Developing in Pairs”. Larry Constantine talked about “Dynamic Duos” in his book “Constantine on Peopleware” published in the same year. This concept went on to become an integral part of Extreme Programming.Though lot of research has been conducted to show the effectiveness of pair programming, the concept or philosophy does not really reflect in the Agile Manifesto. Feature Driver Development was initially devised by Jeff De Luca.The best practices of FDD are, (1) Domain Object Modeling, (2) Developing by Feature, (3) Individual Class (Code) Ownership, (4) Feature Teams, (5) Inspections, (6) Configuration Management, (7) Regular Builds and (8) Visibility of progress and results. Interestingly, “Individual Class (Code) Ownership” goes against the concept joint code ownership which is considered a key practice today. He has a LinkedIn page but it is empty with no connection! 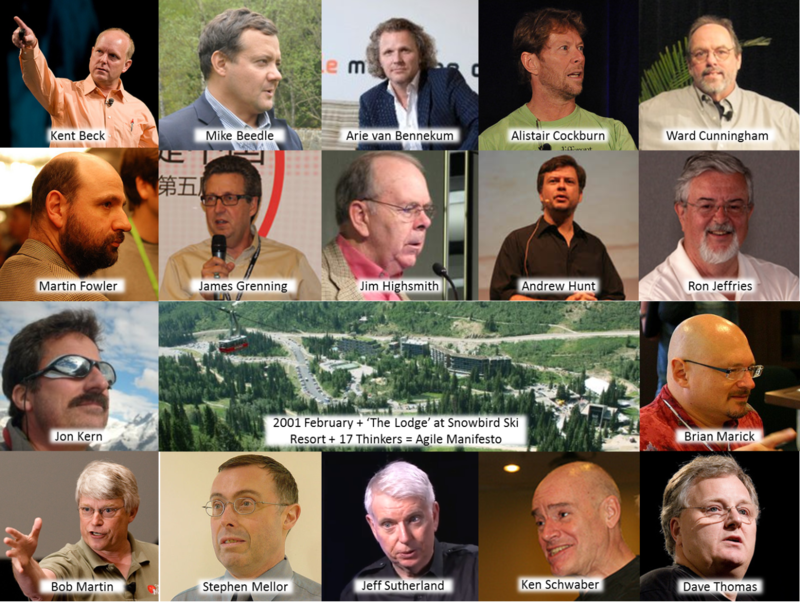 Jon Kern, one of the authors of the agile manifesto, had closely worked with both Jeff De Luca and Peter Coad and had helped shape the charter on FDD.Here are his “Agile Manifesto Notes – Feb 2001, Snowbird, Utah“. These have been dug out and hosted by Jeff Sutherland. 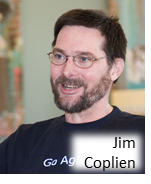 Jim Highsmith formalized the Concept of Adaptive System Development and published a book with the same name.The idea grew out of his work on Rapid Application Development methodologies.He proposed a three phase lifecycle of – (1) Speculation, (2) Collaboration and (3) Learning. 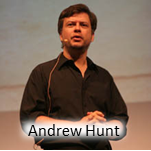 Andrew Hunt published the book The Pragmatic Programmer: From Journeyman to Master.The book laid out characteristics of a pragmatic programmer as the one who is (1) Early adopter / fast adapter, (2) Inquisitive, (3) Critical thinker, (4) Realistic and (5) Jack-of-all-trades. 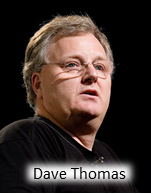 The coauthor of the book was Dave Thomas.If you go through the detailed list of recommendation you will see its influence on the manifesto.Here are his recollection of the what transpired in the meet in 2001 February – “Some Agile History“. 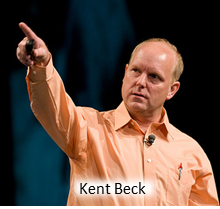 While Kent Beck was working at Chrysler he developed the concept of Extreme Programming. 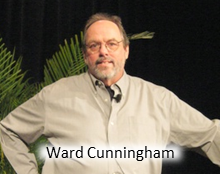 He published the method in 1999 as a book – Extreme Programming Explained.As a part of Extreme Programming, he also introduced the concept of User Stories and Release Planning.The methodology specifies best practices for planning, managing, designing, coding and testing. 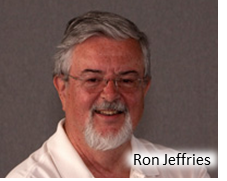 Ron Jeffrieswas also the collaborator and three of them together are considered as the founder of XP.His biography page states that he developing software longer than most people have been alive. (See: Biographical Notes). 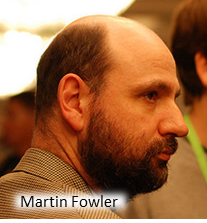 Though some people think that Martin Fowler introduced the term Continuous Integration in reality CI has also been coinedby Kent Beck.Here is his recollection on the “Writing The Agile Manifesto“. For TDD the credit goes to Kent Beck. The concept of Test Driven Development also originated from XP test-first approach. It was given a shape later by Kent Beck through the book Test Driven Development: By Example. The concept of Planning Poker was formulated by James Grenning.Here is the original paper. What about Brian Marick and Stephen Mellor? He calls himself a “Freeter”, a Japanese word, derived from English, that means “free agent.” (Source: His home page)He resides in Zimbabwe and here is his LinkedIn profile. Is Lean Software Developmentan extension to agile methodology? Should we look at it as something distinct from agile? Should it find a place in this post? 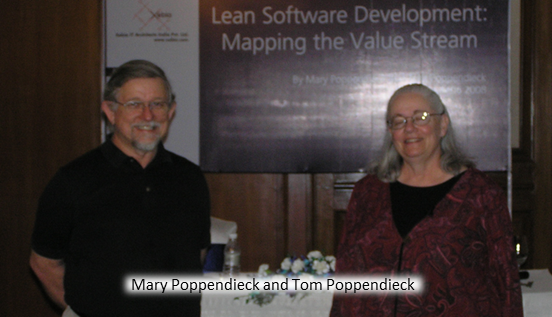 I have included it for the primary reason that many agilists consider it to be one of the future directions of agile movement.Anyway; term was coined by Mary Poppendieck and Tom Poppendieckin 2003.It is an adaptation of lean manufacturing principles and practices to the software development. There are seven principles – (1) Eliminate waste, (2) Amplify learning, (3) Decide as late as possible, (4) Deliver as fast as possible, (5) Empower the team, (6) Build integrity in and (7) See the whole. Amplify learning, deliver as fast as possible, empower the team etc. goes very well with agile principles. I am not so sure about eliminate waste and see the whole. Hi, I’ve been writing a post on the history of agile also, and used some of your info here for reference (especially the period 1992 – 1998). This is my post: https://allagile.wordpress.com/2018/07/11/a-brief-history-of-agile/ . Please let me know if this ok with you. Hey! Do you use Twitter? I’d like to follow you if that wohld be okay. I’m absolutely enjoying your blog and llook forward to new updates. A great list and very nicely presented. This one of the best articles which sumarizes the great names who “invented” the agile methods. Congratulations. 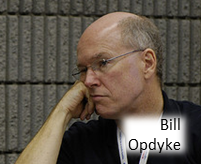 A landmark paper by Coplien was “Borland Software Craftsmanship: A New Look at Process, Quality and Productivity” ( http://citeseerx.ist.psu.edu/viewdoc/download?doi=10.1.1.127.8518&rep=rep1&type=pdf ) which certainly influenced Jeff Sutherland for certain parts of Scrum (specifically stand-up meetings), and Kent Beck’s approach to XP. That paper was also instrumental in leading Coplien himself to study the Organisational Patterns of Agile software development ( http://en.wikipedia.org/wiki/Organizational_patterns ), which nowadays are incredibly undervalued, and often simply unknown or ignored in many agile circles. Yes – RAD and Spiral are precursor to agile but I have not included them because these methodologies do not focus on either team dynamics or direct communication, an essential part of agile. 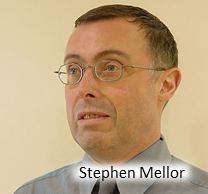 Re: Stephen Mellor. The Zimbabwe location is a joke! I have heard a lot about “Agile” movement, but I never saw the whole picture. Thank you Udayan for a wonderful summary with images. I like it. Great post! You really put a lot of work into it. Thanks for including links to LinkedIn! It’s actually quiote comical the number of people who still cling to the waterfall model. Poor Dr. Royce – too bad most have never read his seminal paper from 1970 that clearly stated on page 2 that waterfall was “risky and invites failure” as he went on to describe an early version of an iterative approach (see the original paper here http://leadinganswers.typepad.com/leading_answers/files/original_waterfall_paper_winston_royce.pdf). Royce’s paper presented waterfall as an example of a flawed, non-working model. Yet the PMBOK, BABOK and other methods and BOKs are based on this “flawed, non-working model” . Einstein had a phrase for this – doing the same thing over and over and expecting a different result is the definition of insanity. Great history of Agile. I would add that Agile is as much about how you think and behave as it is a method. And can we not stop with the waterfall already!